In a large bowl mix together the ground beef, eggs, grated cheese, breadcrumbs, garlic powder, salt and a little pepper. Form into bite sized meatballs. Heat a LARGE skillet over medium high heat. Spray generously with PAM non stick cooking spray. Place the meatballs in the pan and brown on each side. Place on a dish to the side. To the pan, give another spray of oil and add in the garlic and onion. Cook a few minutes until softened. Stir in the tomatoes, basil and a little salt and pepper. Simmer the sauce for 20 minutes. Add in the pasta and cook for about 5 minutes, stirring occasionally. Add the meatballs back in the skillet and cook another 3-4 minutes until the pasta is cooked through, again stirring occasionally. Garnish with grated cheese and some fresh chopped parsley. 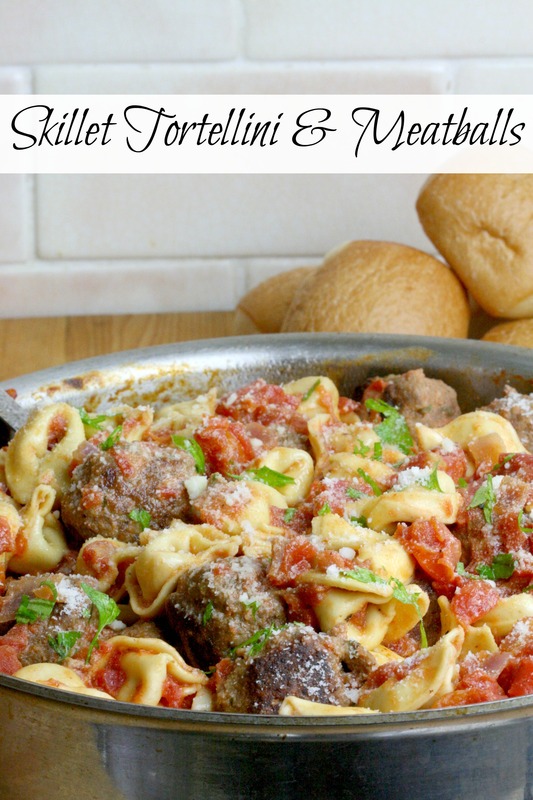 This Skillet Tortellini & Meatballs comes together all in one skillet, has great fresh flavor thanks to a quick and easy sauce. 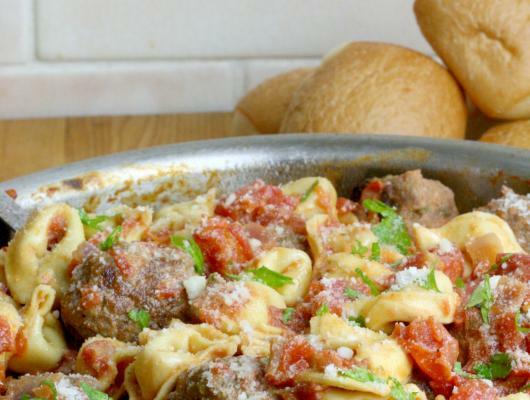 Its hearty, delicious and a real family pleaser! !